Formula One is the fastest and most advanced car racing in the world; it’s on par with Aerospace technology. 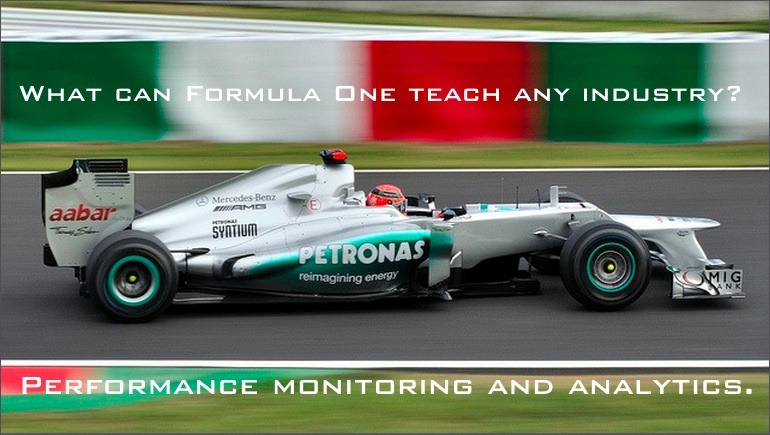 A fascinating behind the scene aspect of Formula One racing is data analytics. A 2013 ComputerWeekly post reported that each McLaren car on the track had 160 sensors transmitting 1GB of raw data in each race. The amount of data as well as engineers and data analysts increases by each year, says Forbes. The onsite F1-team at the track and the remote Mission Control team at the headquarter location, thousands of kilometers away, see near live data feed. It’s real-time analysis of essential metrics such as tire pressure and temperature, fuel burn efficiency, torque, downforce, and more. This, combined with predictive models and simulations, give the management adjustment recommendation (called ‘decision support’ by Team McLaren) for the next pit stop or the ability to create a new race strategy. Things that mean win or lose a race. And since measuring the right information is a key, the exact number of data points and metrics collected is a team secret. This is pure magic in hands of the Team McLaren. So much that they supply the telemetry systems for all its F1 competitors. But it doesn’t stop there. They soon figured out they can monetize their expertise outside the F1 racing. Thus, McLaren Applied Technologies was born and grown into a powerhouse to consult a variety of clients, Bloomberg describes. What can Formula One teach any industry? In a nutshell: the value of performance monitoring and analytics. Telemetry and data analytics are not only reshaping businesses of all kind but also our world and culture in a big way. It’s metric times. Optimum Biometric Labs’ data analytics tool and expertise assist biometrics vendors and operators. The company is leading an OASIS standard that makes biometric capture devices, algorithms, and systems to become like Formula One cars. That is to transmit their performance for data analysis and operations improvement.